In the early 90s, I twice ventured to Russia. It was the end of the communist era and I was 15 years old. One trip was with a school group during the dreary winter months and another with my parents and friend during the long summer days. And I mean LONG summer days. The sun didn’t set until 11pm in St. Petersburg. It was a truly fascinating place, though it was the most eye opening travel experience at that point in my life. During the trip with my school, we arrived at our hotel early. My buddies and I walked into our room and discovered it had not been cleaned yet. Shell-shocked, the only thing I remember seeing was something that has stuck with me for all these years. A giant, half-eaten salami was sitting on the desk. What a disturbing memory. When I returned to Russia in the summer with my family, we stayed at the massive Hotel Cosmos [left, not my photo] in Moscow. Every floor had a reception desk outside the elevator bank. And every reception desk had a woman who directed provocatively dressed blonde females up and down the halls to various rooms. My school group was excited to attend an official Russian hockey game. To our American disappointment, refreshments were not available. But men did serve up vodka in paper cups from random tables throughout the venue. It was not a take-home souvenir cup though. The seats were far away, but those players were superb though. Up until these visits, my life had been very fortunate. In Russia, I saw people struggling more than I could comprehend. holding her shirt up to expose her breasts. An empty bucket sat before her." 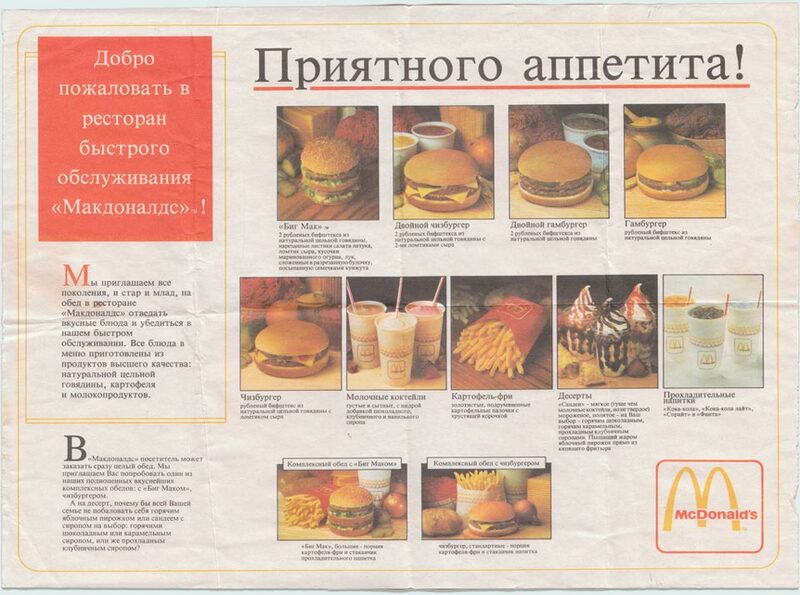 My school pals and I were very excited to visit the newly-opened McDonald’s in Moscow with all its 34 cash registers. By far, the largest in the world. We hadn’t eaten much since we had arrived so we spared no expense. I ordered a Big Mac, 6 Piece Chicken Nuggets, Large Fries and a Coke. I was then overwhelmed with guilt upon passing a family of 4, slicing a single cheeseburger into quarters in the center of their table. Walking in St. Petersburg at night, we passed a long line of older women. They were simply waiting to pick up bread. I did an experiment. Our school had instructed us to bring bags of "fun-size" candy bars to hand out during our trip, which included a visit to a school. I always left an open bag in the hotel room that was slightly tucked away, out of site. Each day, I noticed 1 or 2 bars would go missing. Thus proving that one cannot resist the temptation of chocolate! While the salami in the hotel room was surely a surprise, the Moscow subway system was an incredible sight [see below, not my photos]. The escalators took you down deep into this architectural / design paradise. Experiencing an unknown alphabet for the first time made navigating the system difficult, but we quickly learned you just have to count the stations. There are the obvious places in Russia to experience, such as Red Square, Gorky Park and the Hermitage museum, but it’s the small details of what you remember the most that seem to stick with you longer. There is a 20 year gap since the first visit and the writing of this piece. Russia seems to have a come a long way as an economic power here within the world.